To toast coconut and almonds, spread over a tray and bake for 5 – 6 minutes in an oven preheated to 180°C, or toss in a hot pan until just golden. As long as the cream is thick enough to stay on the biscuits without running quickly off the edges it will do the job perfectly, however if you feel it’s too thin at the end of Step 2 you can refrigerate it for an hour and beat again. To cut biscuits into smaller pieces use a serrated knife in a sawing motion so they don’t shatter or crumble. With a hand-held mixer beat the cream cheese until smooth. Slowly add cream, beating to incorporate well as you pour, then continue to beat for 1-2 minutes until it thickens and holds soft peaks. Add the condensed milk, vanilla and lemon juice to the cream and beat until the mixture begins to re-thicken and the beaters leave trails on the surface. Spoon 1/2 cup of the cream into a separate dish, cover and place in the fridge for toping the cake when it’s ready to serve. Line a 1.5 litre loaf tin with cling-wrap to cover the base and over-hang on all four sides. Spread ½ cup of the remaining cream in the bottom of the prepared tin and arrange a layer of biscuits on top, cutting a few into smaller pieces to fill any gaps. Dollop over a quarter of the cream (about ½ cup again) and spread to cover the biscuits. Top cream with a third of the papaya slices and a third of the drained pineapple. Repeat with biscuits, cream and fruit for two more layers, then finish with a final layer of biscuits and the remaining cream. Cover the surface of the cake with the over-hanging clingwrap. Press gently to compress and refrigerate for 8 hours or overnight – giving the biscuits plenty of time to soften. When ready to serve, peel the cling-wrap off the top of the cake and invert onto a serving platter. Remove all cling-wrap and discard. Spread the top and sides of the cake with the reserved cream. 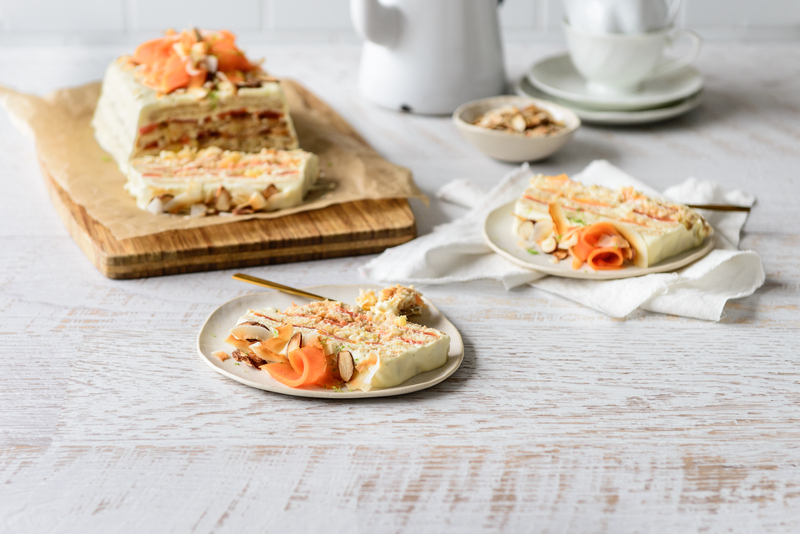 Decorate with the coconut, almonds and extra papaya. Keep cake refrigerated until ready to slice and serve.